James Murdoch, the son of Rupert Murdoch, is to take control of News Corporation's operations in the UK, Europe and Asia. This makes the 34-year-old arguably the most powerful individual in British media and marks him out as the heir apparent to his mogul father. He will run News Corp's UK newspapers, including the Times and the Sun, and Asian satellite TV arm, Star TV. BSkyB announced that he would leave his post as the firm's chief executive. "James is a talented and proven executive with a rare blend of international perspective and deep, hands-on experience in improving operational results," Rupert Murdoch said. Rupert Murdoch has stepped down as Sky's non-executive chairman to be replaced by his son. News Corp will be reconstructed to carve out Europe and Asia as a discrete business division under James Murdoch as its chairman and chief executive. He is currently chief executive of British Sky Broadcasting, in which News Corp holds 39%. 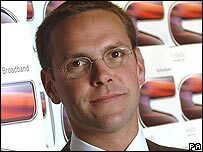 James Murdoch will give up his executive duties at Sky, to be replaced as chief executive by the finance director Jeremy Darroch. However, the board of Sky decided it did not want to lose James Murdoch's services. So it has taken the controversial decision, against British corporate governance best practice, to appoint him as non-executive chairman, in succession to Rupert Murdoch. "Sky has strong independent directors and we were quite clear that our overriding duty in selecting a chairman was to do what was in the best interest of the company and its shareholders," said Nicholas Ferguson, Sky's senior independent non-executive director. "The appointment of James meets this key test." British investment institutions dislike chief executives becoming chairmen of their respective companies. So Sky's British shareholders are bound to complain about James Murdoch's elevation to the chairmanship. However, Sky non-executives have sounded out the group's leading US shareholders - including Templeton, Capital and Janus - and believe they are supportive of the management reorganisation. Les Hinton, who currently runs Rupert Murdoch's British newspapers, is to become chief executive of Dow Jones, the financial news business recently bought by News Corporation.